The contact wheel FAPI-PA MILLED is the addition to the smooth model. At this type grooves will be milled in the rubber coating.The grooves can be milled into the coating in various widths, depths and angles. While in practice a coating height of 20 mm has established itself as the standard, the coating height is variable as desired. The higher the coating, the more elastic and therefore the softer the contact wheel surface will be. The grooves make the milled contact wheels significantly more aggressive than the smooth contact wheels. The contact wheel’s aggressiveness can be optimised for every application to make high performance possible by the relationship between the width of the grooves and web width. This contact wheel also stands out because of its long service life. 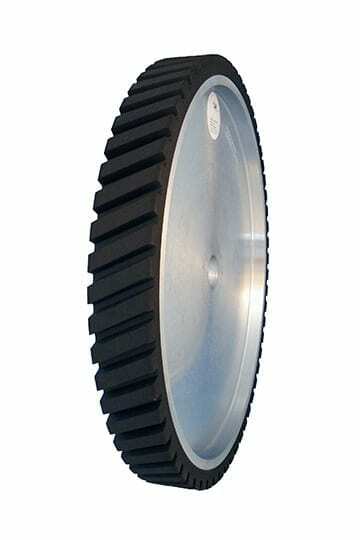 The contact wheels of the FAPI-PA – series are coated only with para rubber. The para rubber (PA) coated contact wheels are in practice often simply called “rubber coated contact wheels” or rubber contact wheels. Because of these outstanding properties, our contact wheels of the FAPI-PA – series have proven themselves in the market over decades. 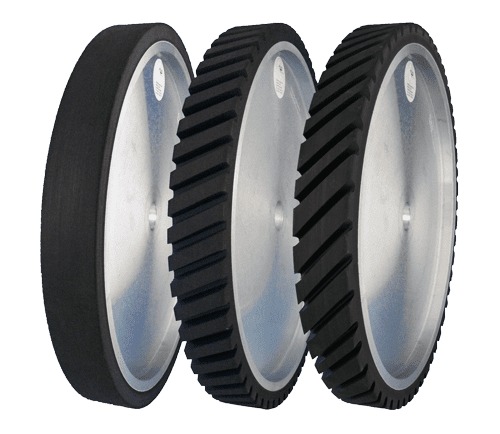 Contact wheels FAPI-PA MILLED are the standard contact wheels often found on machines. Because of their universal usage options, almost all machine manufacturers supply their maschines with contact wheels from this series. The hardness of the para rubber coating can be differentiated into five levels. The coating hardness ranges from an extra soft para rubber coating with 35º Shore (A) to an extra hard para rubber coating with 90º Shore (A). The right contact wheel hardness always depends on the individual application.